Available ( 10 ) Herman Miller ‘Q’. 2-Drawer Lateral File 36″W (Medium Tone color paint on metal Cabinets. 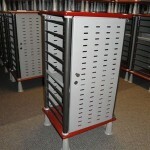 A filing cabinet in any office helps it to keep an office organized. Every office should have at least one filing cabinet. It looks clean and tidy and also offers more privacy and security to the files. You can even lock your file cabinet to ensure no one except you or the person that you trust has the key will be able to have access to any of those files. It doesn’t matter if you have a lot of files that need to be stored or if you have only a few, there are filing cabinets to accommodate your files. 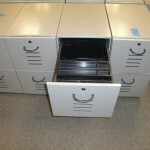 They normally range from five drawers to two. 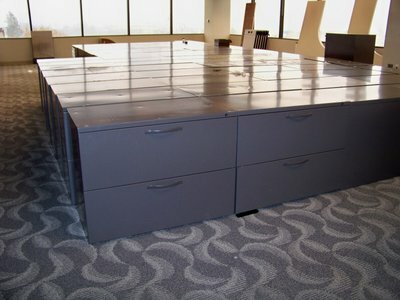 If you have many files and folders that need to be stored and even one of the big cabinets are not enough, you can have a five drawer cabinet in each corner of your office. If your office is fairly big, it would not look strange at all. It would really work to make your office less cluttered and full of visible files. There may be many possibilities according to the space available for cabinets, so for further guidance and help, shop our online office furniture store or contact CubeKing customer service representatives to discuss your file cabinet requirements.